There can’t be many settings that are able to beat the city of Seattle’s in Washington; surrounded by water and mountains, lush evergreen forests and covered by thousands of acres of parkland, it really is one gorgeous destination. This amazing gallery will have the entire family mesmerized with its beautiful glass collection, all created by the artist Dale Chihuly. His works have graced the rooms of 200 museums throughout the globe, and when you visit the gallery you’ll understand why. The venue has intriguing pieces throughout, arranged in various themes, not forgetting the Garden with its captivating collection. There are videos in the theater, from which you can learn so much about the artist, and how he creates his art. The gallery is actually worth visiting both by day and by night, when the Garden is lit up. What an absorbing museum, not only for aircraft fans but everyone interested in the history of flight. The museum has a collection of more than 150 historic air, spacecraft and artifacts with something for everyone as it presents events from Kitty Hawk to the moon. An added bonus has to be the fantastic children’s Flight Zone, in which young future flyers can strap themselves into flight harnesses to test their piloting skills in one of two hang gliding simulators, sit in the cockpits and also learn all about how aircraft are built. The preschoolers in the family can have fun taxiing past a mini air traffic control tower with smart airplane toys on a soft runway floor mural. The museum is on the outskirts of the city but very easy to get to, both by car and bus. One of the first things Seattle brings to mind is the awesome Space Needle, which serves as the city’s iconic observation tower. Built in 1962 for the World’s Fair, it has since drawn in over two and a half million visitors. 605 ft high, 138 ft wide and weighing 9,550 tons, it was built to withstand all manner of climate disasters, including earthquakes of up to 9.1 magnitude and winds of up to 200 mph. Visit the 520 ft observation deck, arriving by elevator that travels at 10 mph, taking 41 seconds. From there you will see the beautiful Seattle skyline, Mount Rainier, Mount Baker and the Olympic and Cascade Mountains. Don’t forget the SkyCity Restaurant, from where you can enjoy a 360 degree panoramic view. (If you make a reservation and eat at the restaurant, the admission for your elevator ride (normally $20+) is included with your meal). Have a fun time exploring Pike Place Market, the buzzy, popular market that has been operating since 1907 and is one of North America’s oldest public farmers’ markets. In fact, with more than 10 million visitors per year, it’s one of Seattle’s most popular tourist destinations. The Market has an interesting layout too; built on the edge of a steep hill, it is made up of several lower levels below the main level, each one home to a wonderful mix of unique shops such as antique dealers, comic books and other collectibles, while on the main level you will find fresh produce like vegetables, fish and flowers, which stand side by side next to craft stalls selling anything and everything from clothing and jewelry to wood products and more. To keep your energy up, why not firstly treat yourselves to a giant cookie at Cinnamon Works? Safeco Field (often referred to as The Safe) has one of those clever retractable roofs so is popular come rain or shine, literally. It is home to the Seattle Mariners (MLB) and can seat up to 47,574 for baseball. Not very old in stadium terms, its first game being played in 1999, the stadium has managed to host some great baseball events, including the 2001 Seattle Bowl as well as WrestleMania XIX in 2003. Besides all the stadium’s seats providing a great view, there are plenty of trucks offering food to please all palates. Make a family day of it; you’re bound to have loads of fun. This is one of the city’s most popular parks, one of the reasons no doubt due to its convenient location. Set in the center of the city with its expanse of water and green areas, Green Lake Park is like an oasis within the melee of busy, city life. As well as offering a natural preserve for the hundreds of species of plants and trees, it is also home to many birds and waterfowl. Enjoy a family stroll along the 2.8 trail that runs around the lake, or join the runners, bikers or boaters if you’re feeling active. There is also a 13 ft asphalt path for wheelchair users as well as plentiful public restrooms and a couple of coffee shops nearby to enjoy after your walk. The EMP Museum is packed with fascinating exhibits certain to delight everyone, as there are so many different genres on display. From the museum’s Rock N’ Roll section which will charm all the music lovers of the family as they explore musical legends from Seattle and experience the music and the memories (sign up for the sound room to dance your way around your favorite soundtrack.) to the horror and science fiction fans who can enjoy the plethora of Star Trek souvenirs, Star Wars artifacts, and scary scenes from numerous Sci Fi books and movies, there are hours of fascinating information to read, hear and learn. There is a good café and a super store to visit too. Does your family include computer geeks? If that’s the case, this is the perfect venue for them. The Living Computer Museum’s mission is to display and preserve working examples of computers from their inception to today’s awesome information technology that we all enjoy. The museum has certainly succeeded, making systems accessible by enabling visitors to interact with them. Even if you’re not technologically inclined you will no doubt still enjoy seeing the working vintage computers that reach back as far as the 1950’s era, and include memory lane items such as punch cards, terminal entry mainframes, and lots of early PCs including IBM and Apple Lisa. A good learning experience for the kids, showing them how things ‘used to be’. The Seattle Aquarium is even better than before, having been refurbished and now expanded to 18,000 sq ft, with $42million of new displays. The aquarium has six different, fascinating exhibits; Window on Washington Waters, Underwater Dome, Life on the Edge, Birds & Shores, Pacific Coral Reef and Marine Mammals. It’s also extremely kid friendly with lots of fascinating things to keep them amazed and interested. For example, they can touch the starfish and sea anemones and will delight in watching the huge octopus being fed, as well as donning a skin diving outfit themselves together with many more fun, interactive things. There is a very well stocked gift shop and nice café too. The zoo is not only situated within a cleverly laid out park with generous areas in which the animals are housed, it is obvious that a lot of hard work and thought into providing natural environments for its permanent ‘guests’ has gone into it too, with a generous rain forest and stream for the jaguar to exercise, plenty of mud for the wart hogs to get dirty happy, and much more besides. Offering great family fun time, the zoo is home to Zoomazium, an indoor facility that includes fabulous multimedia features with interactive nature themed areas for kids up to 8 years. The zoo has some nice on site restaurants but if you want to do your own thing, there are plenty of grassy areas on which to enjoy a picnic too. The Pacific Science Center, designed in 1962 by Minoru Yamasaki for the World’s Fair in Seattle, is a super museum providing lots of science learning fun for kids from the age of 3 (with a special play area for the toddlers of the family, too.). The center features a tropical butterfly house, rotating science exhibits plus laser light shows, and IMAX movie theaters – which are the most popular highlights – together with the constantly changing displays and hands on activities which teach the kids a lot about the world around us. The adults in the family will no doubt find all of this to be of interest too. A visit to this wonderful children’s museum will make a brilliant day out for all the family. The museum’s mission is to bring fun and laughter through the joys of discovery by hands on exploration of the world around them, and with over 22,000 sq ft of play area that was designed for kids 10 months to 10 years to enjoy with their families, it is certainly doing what it set out to do. With daily educational programs and activities that are free with the cost of admission, and the opportunity to spend some bonding time between parents and kids, this is certainly a win win situation for all the family. Seattle must be one of the luckiest cities in North America; the more I explore it the more I realize what wonderful recreation facilities it has to offer, and all accompanied in such a stunning backdrop. And to prove my point, take the family for a walk through the fabulous 300 acre Seward Park which consists of a paved and smooth 2 ½ mile trail around south Lake Washington, along the beach, and up to picnic grounds. In the summer you can enjoy boat races and water skiing as well as baseball games and concerts performed in the amphitheatre. And on a clear day you can see views of Mount Rainer, Mercer Island and the Seattle skyline. Perfect. There are several tours available for exploring underground, where visitors are taken down below Pioneer Square and through the twisty maze of storefronts and hidden alleys that were once upon a time Seattle’s surface streets. Bill Speidel’s Underground Tour is the original tour and also the best known. His tour lasts about an hour and a half and is conducted by super friendly and knowledgeable guides. The tours are recommended for kids as well as adults (though there is a fair amount of steep wooden stairways and uneven surfaces to negotiate so not really recommended for those with limited mobility or toddlers and strollers). This is a fantastic location for a family visit, as there are some really fun hands on exhibits that will certainly keep everyone interested and busy. The museum has a three-dimensional collection made up of approximately 100,000 objects charting the history of the region, so you’ll probably be there for some time. There’s everything from locally invented products, textiles and clothing from the early 1800s and every day household items up to the present day. Of particular interest are the museum’s collection of over-sized vehicles such as a Model T, Al Young’s drag racing car, the first (and locally designed) fiberglass kayak, and a Chris Craft wooden speedboat. Treat the kids for being such good tourists by a visit to the delightful working chocolate factory. Kids 6 and over will be introduced to the makings of this yummy component with an interesting 20 minute presentation covering the bean to bar process, then a walk through the manufacturing area, ending up in the factory’s marvelous chocolate shop together with plenty of free samples along the way. And if you’re planning on visiting on the weekend, you’re in time for the smaller kids of the family to enjoy ‘Chocolate Story Time’ which comes with a kid friendly factory tour and samples. Ride the Seattle Waterfront’s Ferris wheel and get a bird’s eye view of the pretty waterfront as well as Elliott Bay. With a height of 175 ft, you won’t miss a thing, and don’t worry about falling foul to the city’s sometimes damp weather; each gondola, which holds up to eight people, is fully enclosed. The Ferris wheel staff are very friendly and helpful too. And after your trip, you will be able to purchase a picture from one of the onsite photographers as a nice memento. This wonderful library is a marvelous location for kids of all ages, so make sure you don’t miss it. The library, originally opened in 1868 with 50 residents deciding to form a library association, has grown from strength to strength and now boasts 10 floors of amazing art, a massive book collection and an enormous kid’s center absolutely stuffed with books and computers together with a dedicated daily story time. There are stairs, elevators and escalators conveniently situated all around, so no worries there. No wonder “Libraries for All” cemented the library’s reputation as a national treasure, shared, loved and appreciated by all. This museum is an absolute treat for all pinball aficionados. With over 50 vintage and modern arcade games –which are all free to play after the single entrance fee – a visit here will certainly make your day. Available to all kids from age 7, the models which range from 1934 to today include anything and everything from Baby Pac Man, Black Hole, Creature from the Black Lag, Expressway, Missile Command to Buckaroo, Earthshaker, Pinball FX2 LE and many more. Quench your thirst and satisfy your appetite with the museum’s vintage sodas and snacks, and refreshing local craft beers for the adults. This is a fun and informative museum for all, with national exhibits and artifacts that showcase Seattle’s role in the 1890’s Klondike gold rush. With twice daily gold panning demonstrations, two booklets for your kids to complete while going through the museum and friendly and informative park rangers, a visit here would be perfect for some family learning time. Walking tours are available all summer long through Labor Day with kids given a ‘passport’ to stamp along the journey. In addition, there are several interesting videos to watch which works well for kids of all ages. Soundbridge, Seattle Symphony’s Musical Discovery Center is open to the public on Fridays, and would definitely be enjoyed by all the budding musicians in the family – or those simply interested in music – when they hear that all the orchestra instruments are available to try. There are musical themed crafts and a truly magical musical story time to enjoy too. Also of interest, the Discovery Center is host to the Symphony’s First Concerts series which feature short performances and hands on Q&As for the little ones. And don’t worry, mom, the helpful, friendly staff sanitize mouthpieces after every guest. When you want to take a break from all the fabulous sight seeing you’ve been doing in Seattle, why not take the family to the beautiful Snoqualmie Falls? The 268 ft high amazing waterfall lies just 80 miles east of Seattle, and you simply will not want to miss it. Snoqualmie Falls was deemed to be so beautiful by the local Indian tribe, they consider it to be a sacred place. You can either admire the falls with a short stroll after parking the car, walking down a steep path to the plunge pool, or hike with the kids one mile to the base of the falls. The sight is so mesmerizing you’ll find it hard to turn away. There is a gift shop adjacent to the falls. This wonderful toy store is packed to the rafters with two floors of high end, quality toys including puppets, toddler toys, magic sets and an enormous selection of puzzles. Magic Mouse has been operating since 1977 and prides itself on ‘providing merriment to people of all ages throughout Seattle’. The store houses toys from all over the world, with some bound to send the adult members of the family down memory lane, too. With brands like Playmobil, Steiff and Lego, together with children’s books and chess sets, losing yourselves for an hour or two in this magical shop will put a smile on everyone’s face. The Hiram M. Chittenden Locks, (Ballard Locks), is a composite of locks at the west end of Salmon Bay. Opened in 1917, it is a fun and free area for all the family to enjoy walking along the edge of the locks and having a look at all the boats moored there. You’ll be able to appreciate how the boats and yachts are moved up and down from a water level difference of 20-30 feet in a short distance of 100-150 feet. When you cross the locks and descend the steps to a viewing window of the fish ladder, you’ll see the salmon just on the other side of the windows and also be able to read all about the fish you’re seeing on the information boards. For a look (and drink) into a local craft beer experience, why not take a tour of this brewery, the only one in the area that focuses solely on craft beer? 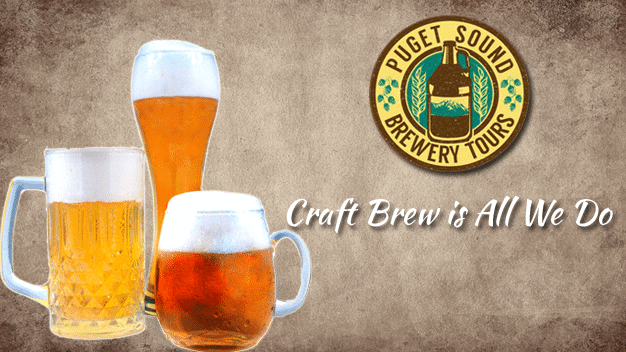 You will be visiting breweries in Seattle, South Seattle, Bellevue, Kent, Everett and the rest of the Puget Sound Region and meeting many of the brewers themselves. The tour guide is very knowledgeable and will answer all your questions as you enjoy yourselves in all the unique tasting rooms. And best of all, once the guide knows your particular beer preferences he will try his best to include some items perhaps not on the tasting menu. Sorry kids, this one’s not for you – but it’s just for one afternoon.